Mark and Kate Mulligan sat in the kitchen of their 1780 farmhouse in Frenchtown, the silhouettes of horses and boarders visible in a large barn across the drive. At the kitchen table Marc, an amateur polo player, seemed to literally hum with pent up energy accumulated during the off-season. Stories spilled out rapid-fire, mostly about competing and traveling with the polo team at Tinicum Park in Erwinna, PA, where Mark plays from mid-May to early October. "In October '08 we went to Egypt with our coach and club manager, Hesham El Gharby. We played against the police in Cairo, who have their own polo field. They really wanted to beat the Americans and played hard. I got hit between the eyes by a ball. It came in just under the rim of my helmet. You can see the mark on the rim." Mark rubbed the skin just over the eyebrows and laughed. "I still got off a back shot." Husband and wife shared a brief glance. "Kate checked on me during the night, made sure I didn't have a concussion. I could have used a stitch later. My face swelled so much the skin broke. The next day I had two black eyes." "You should have seen the bruises." Kate shook her head. Winter break is a source of pride and torment for Mark. The Mulligans appreciate the value of a holiday, for horses as much as people, but Mark is clearly antsy to get back in the saddle. Kate, as Executive Director of Dreams Come True, a therapeutic riding program in Pittstown, seems almost as eager to see the horses back in work and ready for a May 2010 charity match at Tinicum Park. The couple heads out to a paddock where the polo ponies which are actually medium-sized horses mill by a gate. Blankets cover their bodies and provide little hint of the horses' streamlined profiles, the large hindquarters and light front ends that help them maneuver like torqued-up go-carts. "This is Andojeto. She is ten years old. I've had her since she was five. She came right off a plane from Argentina. She had cleared quarantine and was at a farm outside Newburgh. The original client did not want her. I bought her that day. Wiley came from Argentina too." Mark pointed to a white horse with pale eyes. "He was imported by a pro whose client look at the horse and said he didn't like blue eyes." "He's a good horse," Kate added later. "He's terrific. He can turn on a dime. He's not as fast, but he's better suited for this level of play, which has a lot of start and stop." "They're tough. Most get a simple diet of pellets and a lot of grass." When asked about supplements and medications, Mark grimaced. "I don't give them drugs to play. Aspirin can mask an injury. I want to know if a horse is sore. If he is I don't play him. We bring electrolytes so they drink. We'll also use topical ointments. They do well with this; I played one pony until it turned 34." Their stories swirled together until the details disappeared in a babble of jargon, geography, and anecdotes: Argentina, Egypt, ponies fresh off the planes, matches, rankings, players, teams. It is heady stuff really, enough to evoke Nick Carraway's wonder at Tom Buchanan in The Great Gatsby, traveling east with six polo ponies in a style that rather took one's breathe away. It is easy to forget that polo is an extraordinarily demanding game. Divided into four to six chukkers (or sets) that last seven and a half minutes each, polo requires extraordinary athleticism. In those seven and a half minutes, the four players on each team gallop, spin, pivot and block their way down a field that measures 300 yards by 160 to 200 yards (depending on the presence of sideboards), in an attempt to drive a 3" to 3.5" ball between goal posts at either end of the field. Two mounted referees, in black and white striped jerseys, keep an eye on the play. A third referee in the center of the field settles any disputes. The game's general format reflects the simplicity of the original games, developed over two thousand years ago in central Asia. Versions of those rough games still exist; in Kazakhstan, in a game called kokpar, mounted players fight to place a headless goat in a goal. Adapted by British officers in nineteenth century India, modern polo dispensed with those less savory aspects. The Brits replaced the carcass with a ball, added mallets and a playbook, and exported the game to their home country. But, in keeping with a sport called the "game of kings", little about polo is simple once one begins to play. Purchasing the correct gear requires solid horsemanship and knowledge of the game. The list can seem endless: the saddles and pads, wraps and boots, girths and overgirths, bridles and martingales and breastplates for the horses, the helmets and mallets, britches and boots, knee pads and elbow pads, gloves and spurs and whips for the players. Each horse has its own full set of tack and waits, suited up and ready to go. Players have little time between chukkers to rest, much less change gear. "You can think of it like NASCAR," Laura McDevitt, of Fieldview Farm in Pittstown, home of the Bonnie Brae Polo Classic, explained. "You need to get out of that pit and back into the game, not spend time changing all that stuff." Then there is the skill itself, which takes years to hone: the skill to gauge distance, establishing the rhythm of the swing with the stride of the horse, in order to complete the arc of the mallet so that it connects with just the right amount of force and in such a way to direct the course of the ball often while galloping full speed ahead, damn the torpedoes. Players must carry the mallet in their right hands, which means swinging their right arms over the pony and twisting sideways to get a shot off the left side (which explains the occasional back braces for the silverbacks) Ñall that while their ride bounces and leaps underneath with the agility and spring of a thousand-pound Slinky. Players live by their rankings, which range from one to ten—the higher the number, the more skilled, and valued, the player. Winston Churchill once supposedly claimed, "a polo ranking is a passport to the world." Heading onto the field at the Bonnie Brae Polo Classic. The real stars, however, are the horses, or "ponies." 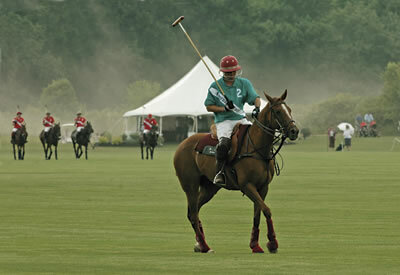 The rules of polo, in fact, place the safety of the horse as one of the game's highest priorities. 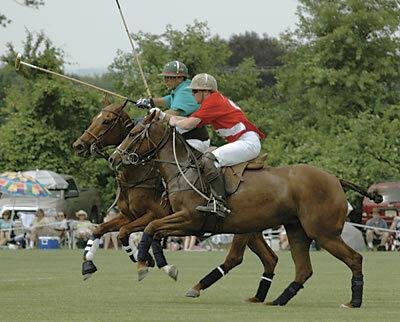 Most ponies play one chukker, which is designed to limit the amount of time a horse can fully exert itself without harm, although some ponies will return to play a second chukker. To play one match, a player needs at least three horses. Professionals often travel with six. They prize the horses, which require years of training. If the animals reach the upper levels of the sport, they will have developed the equine version of Lance Armstrong's lungs and Michael Jordan's reflexes. Wealthy "patrons" in Argentina, who sometimes sponsor entire teams, have been accused of valuing the ponies more than the players. Each pony, comes with its own quirks and idiosyncrasies. At Fieldview Farm, Jim, who has played polo for twenty years, and Laura McDevitt talk fondly of some of the equine characters that have passed through their lives. "We had one horse, Forty-Four. When he was good he was fabulous, so smooth and easy. When he was bad É you had to work all the time." Laura's voice trails away. She laughs. "One of our exercise riders said it was easier to get off and carry him. But he was good in the game. He was excellent when he played." She pauses. "A lot of the ponies love to play, love getting out. We had another horse, Rambo, that we had retired. He could not bear to be alone. If we left him behind you could hear him from the field, whinnying and screaming in the barn. We had to ship him out. He'd stand at the trailer, not playing, but happy. We couldn't leave him behind." The McDevitts keep five playing ponies, as well as retirees, on their property. "We bred one that's playing now. There are other homebreds coming along, part Argentinean and part U.S. thoroughbreds. We like horses with good attitudes. Pros can hit a ball when it is airborne. It is just as extraordinary to get the horse to accept that. The game weeds out the unstable animals." It is not enough, of course, to have horses and gear. Players need a field. What the sport can inspire is evident in the jaw dropping grounds at Fieldview Farm, where the McDevitts carved out space for the ponies. "We graded the field and screened all the topsoil to take every rock out," Jim explained. "The construction took more than a year. It took another year and a half to grow in the grass. Rutgers University did the grass mix for us. They have created the most varieties of bluegrass in the world. Our grass has real strong roots, good recovery and tolerates drought." The result: a green that looks suitable for the PGA. Few such grounds exist in the New Jersey and Pennsylvania area. Many players prefer warmer regions, for the climate and the potential prize money. Even so, it is possible to watch players and their mounts practice and compete. For spectators, the most exciting matches usually involve charity fundraisers, which can provide as much entertainment as matches played for prize money. At these matches, even spectators can compete, albeit from the safety of their tents. Prizes can range from awards for the most creative hat to the best tailgate. Most people come out for fun, but for those interested in learning more about the rules of play, details can be found here. On June 13th, Fieldview Farm, in Pittstown, will host the 16th Bonnie Brae Polo Classic to benefit the Bonnie Brae School (www.bonnie-brae.org) in Liberty Corner, New Jersey, a residential youth treatment and educational facility for at-risk NJ boys.